My interest in designing (and building) Merlin Rockets* began in 1965, when I contacted the then top designer in the Class, Ian Proctor, with a view to obtaining a set of plans for DIY building. He declined the request, as he wanted to support the professional boatyards. So I borrowed a book on yacht design from the library, and set about designing my first Merlin Rocket. I was 19 at the time. ..... Hebron was launched in 1966. * 'Merlin Rocket' is a trade mark of the Royal Yachting Association. 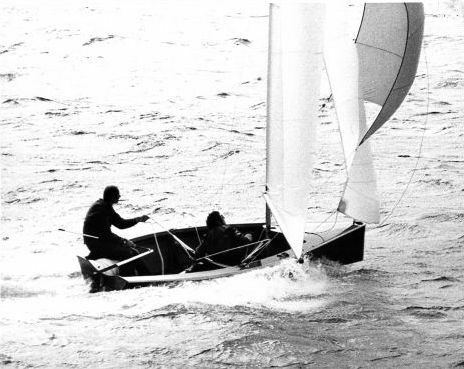 For details of the early history of the Merlin Rocket dinghy, see "The First 6 Years". NEW FOR 2012: Library of Technical drawings. This section is dedicated to my friends Ian Perkin and Alf & Joan Darlison, who sailed Merlin Rockets with me at the Up River Yacht Club (1966-1973), but who are no longer with us. Their enthusiasm and encouragement was fundamental to my enjoyment of my early years in those delightful dinghies.